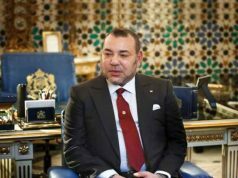 King Mohammed VI has chaired the launch ceremony for the building of what is set to be the tallest building in Africa, "Mohammed VI Tower,” in Sale, near Rabat. 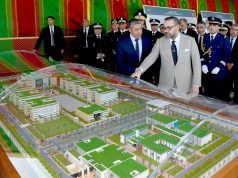 King Mohmmed VI t the launch ceremony of building the tallest building in Africa, "Mohammed VI Tower,” in Sale. near Rabat. 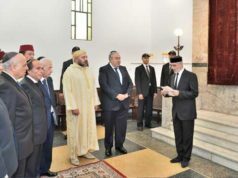 Rabat – Othman Benjelloun, CEO of BMCE Bank of Africa, expressed his wish to name the tower after King Mohammed VI in a speech before the King on Thursday, November 1. 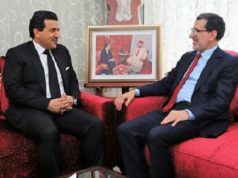 The Moroccan BMCE Bank of Africa is sponsoring the project, which will cost an estimated MAD 4 billion. The tower is expected be finished on May 30, 2022, BMCE Bank announced on October 11. 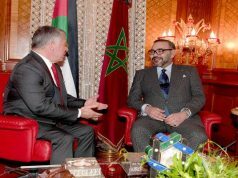 The Mohammed VI Tower will have 55 floors with a luxury hotel, offices, and apartments. An observatory will crown the tower. The 250-meter tower could be titled the tallest building in Africa. The tower would replace Johannesburg’s Carlton Centre, currently the tallest at 223 meters. 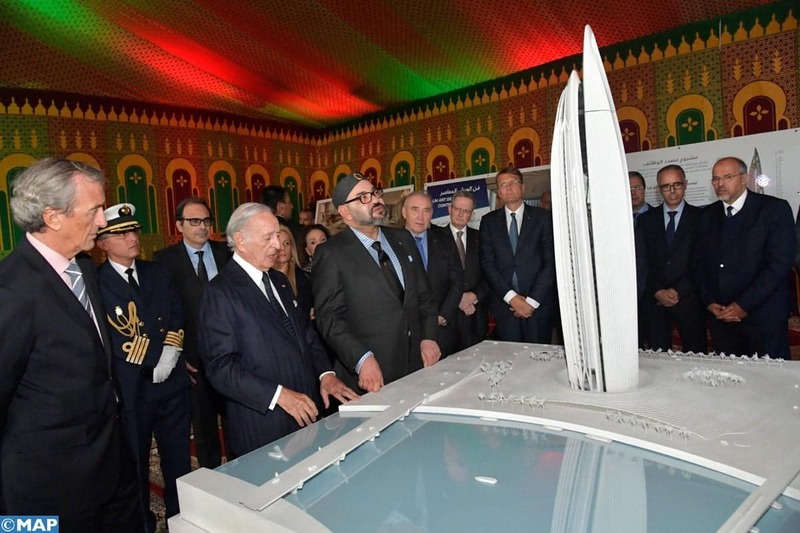 Benjelloun said that the tower project conducted “multidimensional preliminary studies” including geological, technical, architectural, and environmental since King Mohammed VI laid the first stone of the tower project on March 9, 2016. The Moroccan construction company TGCC and SIXCO (Six Construct), the Gulf subsidiary of the Belgian BESIX Group, signed a contract to design and build the tower on October 4 in Dubai. The China Railway Construction Corporation International (CRCCI), which was originally contracted to build the tower, will continue to accompany the newly contracted companies. Johan Beerlandt, Chairman of BESIX board, spoke about his company’s international expertise in tower construction. BESIX Group was part of the construction of the Burj Khalifa in Dubai, the tallest tower in the world, the Four Seasons Hotel in Manama, the Sheikh Zayed Grand Mosque in Abu Dhabi, and the Carpe Diem towers in Paris. The group operates in Europe, the Middle East, Africa, Asia, and Oceania. The Mohammed VI Tower will be the icon of the new Bouregreg Valley development project, a major part of the program “Rabat Ville Lumiere, Capitale Marocaine de la Culture” (Rabat, the City of Light, the Moroccan Capital of Culture).